Soothing Serenity and Pure Pristine Tranquility at Ontario's Premier Wellness Experience. Borealis is a vitality destination, a new experience in experiential tourism. Rejoice in the world's ultimate living foods...Our raw "super juices" for health and longevity. Super juices are the forefront in raw foods. Super antioxidant fruits fresh from the orchards, gently pressed to extract the nutrients from the living cells inside are part of the whole body wellness at Borealis. Experience a living, working fruit orchard. Let yourself heal by rejoicing in nature's goodness. Immerse yourself in the peaceful wilderness of Northern Canada. Learn yoga, mediation and relaxation while you unplug from the world. Re-boot your body and soul. Find your inner peace. A place away from the rush and bustle. A place just for you. Find yourself at Borealis. Limited bookings available starting spring 2016 for 3 day weekend stays or 4 day weekday stays. Your all-inclusive retreat stay includes yoga and mediation sessions, our living super juices, and gourmet vegetarian meals prepared with local ingredients. You have a choice of either shared or private accommodations depending on your preference of stay. 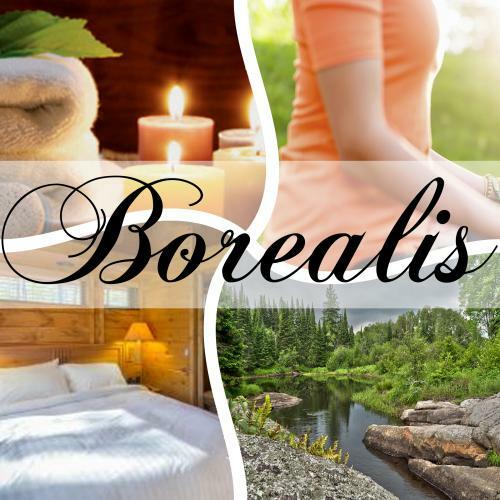 The ultimate in luxury chalet accommodations, Borealis is a sustainable surrounding, built with natural woods, marble, granite, set among pristine Northern Canadian wilderness. Contact us to book a stay.